The Tennessee Holocaust Commission (THC) announces the opening of registration for the Memphis Educational Outreach Program. The program will take place on Thursday, October 27, 2011 from 8:00 a.m. – 3:30 p.m. at Teaching and Learning Academy located at 2484 Union Avenue in Memphis, TN. This year’s program, The Power of Responsibility in the Holocaust and the Age of Genocide, will highlight the work of the Teaching History Matters Project, the work of a United States Holocaust Memorial Museum Teaching Fellow. This USHMM Fellow, along with his students, began studying information about a “Death Train” that was liberated at Farsleben, Germany which is near Magdeburg. The class posted an online journal in attempt to re-connect this train transport of 2,500 Holocaust survivors with the American soldiers who liberated them on April 13th, 1945. 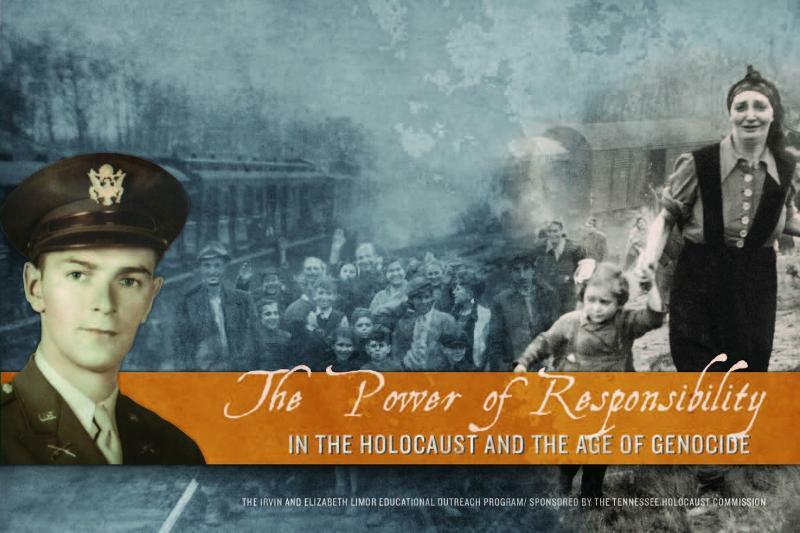 To date over 200 survivors and liberators from this train have been located and reunited.This one-day conference is specifically designed for middle and high school teachers to provide them with additional knowledge and resources about the Holocaust. Educators are encouraged to identify up to four mature students to accompany them to the all day workshop for hands-on activities and interaction with survivors and educators in the field of Holocaust studies. Teachers intending to bring students are required to fill out a student registration form which can be found on the event home page. The program is open to all middle and high school teachers, preferably with some experience in teaching the Holocaust. There is no cost to attend the conference. Registration is required and space is limited. Christina Chavarria, National Outreach Coordinator at the United States Holocaust Memorial Museum, will present a workshop titled, Placing Elie Wiesel’s, Night into Historical and Literary Context. Elie Wiesel’s philosophy, “…to remain silent and indifferent is the greatest sin of all…,” is a testament to the power of responsibility and this philosophy stands as a summary of Mr. Wiesel’s, views on life and the driving force behind his work. Night is Elie Wiesel’s personal account of the Holocaust as seen through his eyes as a 15-year-old boy. Ms. Chavarria’s workshop will help teachers to contextualize history through a series of photos as it impacts the narrative of the memoir. Specific writing prompts and themes for the book will be explored. The workshop will conclude with information regarding the US Holocaust Memorial Museum online resources on Elie Wiesel/Night. Dr. Paul Fleming, principal of Hume-Fogg High School and co-author of The Holocaust and Other Genocides, will present a workshop for teachers on the Nuremberg Trials. The Nuremberg Trials were the first trials in history held for crimes against humanity. As noted by one of the lead prosecutors in the trial, Justice Robert H. Jackson, these historic trials imposed a grave power and responsibility on all parties involved. Since 1946, the Nuremberg trials have served as a basis for much of current International criminal law serving as a foundation for human rights and ethics policies around the world. From international conference at Hudson Falls High School in Sept. 2011, featuring survivor Leslie Meisels and soldier Buster Simmons. National Anthem by HFHS Choraliers under the direction of Mrs. Diane Havern. Photos by Rob Miller and others. 4 minutes. 1st of series of educational videos from conference.